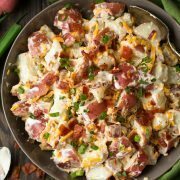 Such an easy flavorful potato salad recipe! Just cook potatoes in boiling water, drain and toss with ranch, cheese and green onions. A new summertime staple! Cook potatoes in boiling water: Add potatoes to a pot. Add enough water to cover potatoes by about 2-inches. Bring to a boil over medium-high heat then reduce heat to medium and allow to boil until potatoes are fully tender, about 10 minutes. Drain potatoes: Carefully pour potatoes into a colander to drain. Set aside to cool (to speed cool them run them under cold water until cool). Toss potatoes with dressing, and mix-ins: Pour cooled potatoes into a large mixing bowl. Add in ranch, cheddar, bacon and green onions, toss to coat. Season as desired: season with salt and pepper to taste. Serve or cover and chill up to 1 day (if you like the bacon crispy wait to add it until ready to serve). You can set aside a few tablespoons of the bacon and green onions for garnish if desired.